Jerry Hicks lodges complaint after revelation that Unite sent over 158,000 ballot papers to 'former members'. 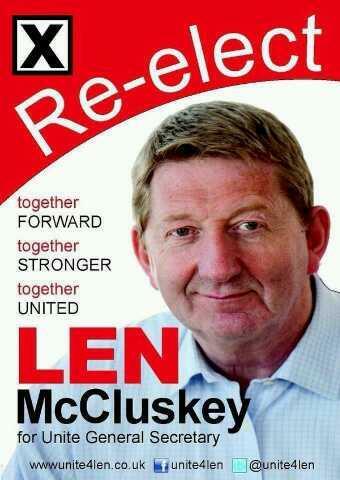 McCluskey: "It's Time to Deliver"
Len McCluskey, 63, won the election in April with a margin of 60,000 more votes than his opponent Jerry Hicks, who surprised everybody by polling nearly 40% of the vote. Remarkable given that he [Jerry Hicks] remains unemployed following his unlawful sacking for Trade Union activities by Rolls Royce in 2005. But Jerry Hicks is complaining that between the end of December last year and January this year the union increased the number of potential voters in the leadership race by about 158,000. He has written to the trade union watchdog – the Certification Officer - to ask how "former trade union members" could be allowed to vote in the leadership election. During the election there were some attempts to slur the name of Jerry Hicks, and these matters are also included in the complaint. The certification officer has wide-ranging powers and in 2011 forced construction union UCATT to re-run a leadership election, declaring the vote invalid. The Barrister acting against UCATT on that occasion was Jody Atkinson, and he is now representing Jerry Hicks on a ‘pro bono’ basis [free of charge]. Mr Atkinson said " it appeared that Unite had been balloting people who had left the union, most likely because they had not paid their subscriptions. And it seems that ballot papers have been sent to people who have not been members for years." In an interview with ‘The Guardian’s Randeep Ramesh’ Jerry Hicks said “that he was told by Electoral Reform Services, which oversaw the union ballot, that Unite had identified "there was a group of 'members' who the Union had considered no longer to be members of the union" but "it was decided that they should be treated as continuing members and therefore for the purpose of the election eligible to vote" More interestingly it might be that as many as 77,000 of the 158,000 ballot papers had no postal address at all, so what on earth happened to them? Jerry Hicks said he wanted "Unite's leadership to explain why people who weren't members of the Unite union could vote in the election of its General Secretary. So far I've been offered no explanation." Jerry Hicks, said Mr McCluskey called the "snap election" after the union's Executive Council last September changed the rule book to raise the retirement age of senior officials to 67 and an attempt was made to double the number of branch nominations required to stand in a leadership election from 50 to 100. Adding “They thought that would deter me but they failed. I am an ordinary member who managed to get more than 150 nominations," The leadership got arrogant about their own power. They are paid six figure sums and have lost touch with ordinary members." 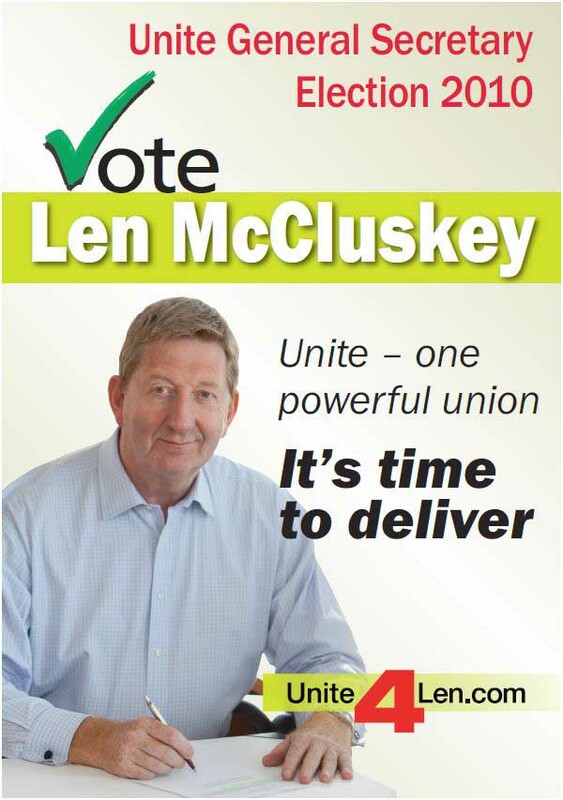 Len McCluskey, who has been Unite's General Secretary since 2010, had called the election early arguing he did not want to take to the hustings in the run up to the general election in 2015. Labour's biggest donor by far is Unite, which has provided 20%, about £12m, of party donations since the election.